At RetractableAwnings.com we bring residential, commercial, institutional and governmental properties to life with our bioclimatic rotating louver roof. The flat as compared to S-shaped rotating louver roof (preferred by customers based on research) are gorgeous and sure to boost the aesthetic appeal of any property. Through state-of-the-art European engineering and design, RetractableAwnings.com’s rotating louver roof system increases natural airflow (ventilation), is 100% waterproof (not water resistant) and has been tested for high winds even hurricanes and is also snow load tested and approved. When residential, commercial or institutional or governmental property owners want to easily switch between basking in the sunshine and relaxing in the shade, rain or snow, our rotating louver roof system is the perfect choice. The rotating louver roof effectively expands the available living space in a property, offering versatile comfort for any property owner. The system operates on a “flap” system similar to venetian blinds that can be rotated amazingly to 110 degrees using a center pivot system. The rotating louvers help to control sunlight and shade during any time of the day. When it’s raining or the user wants some shade, the system can be closed flat and the built-in, invisible gutter system will drain the rain without incident. See the videos on this page for invisible gutter and post drainage. These beautiful and adaptable units are perfect for backyards and outdoor living and dining areas in commercial, residential, municipal, governmental and institutional properties alike. The rotating louvered roof system beautifully accommodates hot tubs, swimming pools, lounging areas, pergolas, patios, decks and much more. For those owning or managing a restaurant, hotel, nightclub, beer garden or pub, the rotating louver roof system will provide comfort and cover 24/7/365. Event coordinators can also use the rotating louvered roof system during weddings, Bar/Bat Mitzvahs, corporate events, baby showers and more. There are many benefits to implementing our rotating louver roof on a property. They have been engineered to meet Miami-Dade County, Florida requirements, meaning they can handle hurricane force winds. They are also approved to handle an engineered snow-load and can be adjusted to control and minimize potential large accumulations of ice and snow. Add in the efficient gutter systems during light or heavy rainfall and the rotating louvers that can that can block the sun glare and harmful UV rays, and it’s clear to see the benefits and value of the bioclimatic rotating louver roof from RetractableAwnings.com. The rotating louvered roof from RetractableAwnings.com is available in hundreds of RAL colors, unlimited width and projection dimensions, and configurations, two different louver sizes and a maximum per unit width of 13.12 feet (400cm). The electrostatically applied polymer enamel baked to 400 degrees, non-rusting 6063-T6 aluminum will weathering for a lifetime. This wonderful system will boost the curb appeal and property value anywhere it’s implemented, and RetractableAwnings.com’s custom design services will ensure that you get exactly what you need and want. What is the difference between all of the retractable patio cover and deck pergola system models you offer? Most models vary in appearance regarding placement of the front beam and the number of guides from front to back – either one or two. All models are water PROOF except for the Perugia, Naples and Milan models. These 3 models are for sun protection and not rain protection. Click here for complete side by side details. The motor on roman fold models that are motorized is always in the rear of the unit and usually located in the middle of the unit on a 3 span unit and on either the left or right side on a 2 span unit. On the Bioclimatique rotating louver roof model, the motor/actuator is either on the left or right side of the frame. For the Naples and Milan models the motors are located inside posts and are not visible. The Perugia model cannot be motorized at the present time. 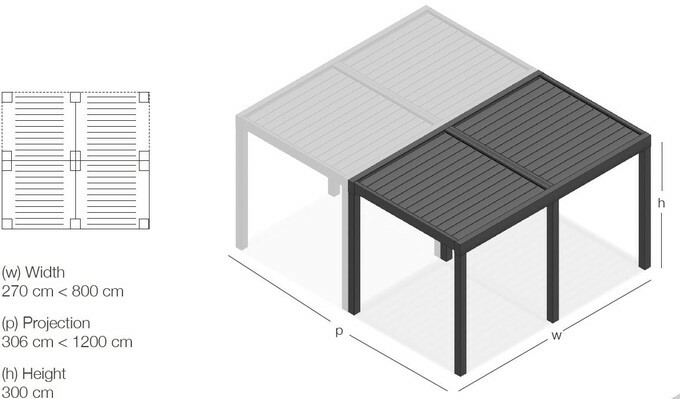 Which retractable patio deck pergola cover system model is right for me? That depends on what type of weather you plan to have the product extended or partially extended in, where you would like to install the retractable patio deck pergola cover system, amount of wind you need the unit to handle when extended or partially extended, the size you need or want (the area you want to cover), whether you want it for sun protection only or sun and heavy rain or sun, heavy rain, hail and snow and of course your budget. Can I leave my retractable patio deck pergola cover system open in the wind and if so, how much wind? 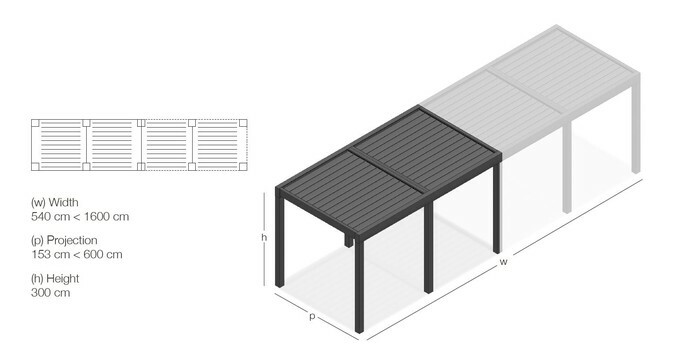 All of our retractable patio deck pergola cover system models are Beaufort wind load approved in the fully extended position from Beaufort 6 (25-30mph/39-49km/hr) to Beaufort 12 (73mph+/118km/hr). Beaufort wind load number between 6 and 12 varies based on model and size (Perugia, Naples and Milan models excluded and are not Beaufort wind load approved). Can I use or leave my retractable patio deck pergola cover system extended during the rain or during the snow season? All retractable patio deck pergola cover systems from Retractableawnings.com can be used for and are designed for HEAVY rain, even hail (Perugia, Milan and Naples models excluded). HEAVY rainfall is considered more than .30” (7.6mm) per hour per the American Meteorological Society. The only model that is designed for heavy rain, hail, hurricanes and snow load is our Bioclimatique louver roof system. Can I install your retractable patio deck pergola cover system on vinyl or aluminum siding, stucco, or on masonry (common materials used for masonry are brick, concrete block, granite, glass block, marble, travertine, cast stone, limestone and cob) or a mobile home? All models offered by Retractableawnings.com can be installed in to any of the above. What is most important, is to use the correct type and size of fastener depending on what substrate the retractable patio deck pergola cover system is being installed in to. Retractableawnings.com provides everything needed for the product except for the fasteners. The decision on fastener type and length used is to be made locally based on the substrate being installed in to along with weather conditions and any building code requirements (if any). Can I mount your retractable patio deck pergola cover system to my wall OR soffit / eave / overhang OR roof OR side of the rafter OR to a beam? Models offered by Retractableawnings.com can be attached to one or more of the following: wall, wall to wall, post to post, soffit / eave / overhang, roof, inside a pergola and side of rafter or beam. To determine the type of mounts available with a specific model, we suggest checking that particular model’s web page. Flat louver creating the appearance of a "louvered roof". The only flat louver manufactured in the USA. Louver/Track Material: 6063-T6 Aluminum. All extrusions manufactured following Aluminum Association tolerances and meet ASTM standards.